Charles Hall, an early developer of the St. Petersburg, Fla., area in the years preceding the great Florida real-estate boom of the 1920s, purchased an avocado grove directly north of the city’s Central Avenue and filed the first plat for the development of Kenwood in 1912. 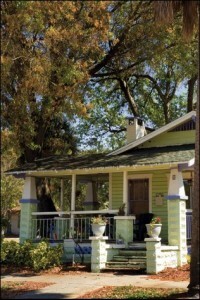 He soon began to subdivide the property, building and selling the newly emerging Florida bungalow lifestyle. 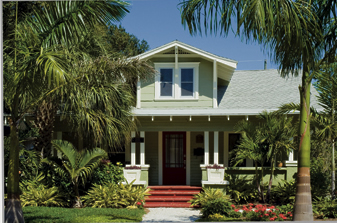 The neighborhood, known now as Historic Kenwood, boasts one of the largest concentrations of Craftsman bungalows in Florida (in part because some 170 bungalows were moved to the area in the 1930s). He built the model home for the neighborhood, the massive airplane bungalow on Central Avenue now known as the Craftsman House Gallery, in what was to become the business district. That district followed as planned and thrived for decades, into the 1950s. Unfortunately, the area experienced the familiar 20th-century American urban storyline of rise and decline. By the late ’50s, residents and businesses were migrating to the suburbs and malls, and 30 years later Central Avenue and the Kenwood neighborhood were left blighted and crime ridden. Interstate 275 was built in the ’70s, cutting the district off from its eastern neighbors, and 34th Street, the western boundary, became more commercial. Small businesses along Central Avenue were shuttered. In the mid-1990s, though, in a pattern that, like the preceding decline, was repeated in cities around the country, an energetic group of urban pioneers rediscovered the area and began moving into its affordable homes and bringing business back to Central Avenue. It was apparent that the neighborhood, with its brick streets and mature live oaks, had great “bones” and was a potential treasure, despite the fact that most of the homes were derelict and almost two-thirds were owned by absentee landlords. The new owners wanted to bring in others who would take care of their homes, raise families and take pride in their community. In 1997, they put together the first BungalowFest, which has become an annual home tour to raise awareness and entice visitors into Historic Kenwood and the nearby business district. Over the next few years, the landscape began to change. The streets began to light up. Closed-in porches began to open up. Newly formed flowerbeds began to pop with color. 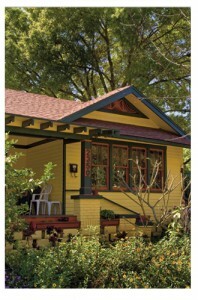 New neighbors began to swap renovation stories and trade paint swatches. 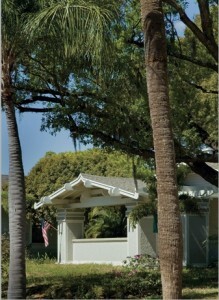 Some restored their homes with a purist adherence to the original period styles. Others decided to have some fun and renovate with their own Florida flourishes. But they all shared a common love of old houses. One of the early objectives of BungalowFest was to showcase the potential not just of Historic Kenwood but of the entire area, including the adjacent strip of Central Avenue, now known as the Grand Central Business District. To do that, BungalowFest chartered trolleys to carry visitors through the Central Avenue corridor, in hopes that they would also see possibilities there. In time, several did open new businesses along the avenue or relocate their offices to the area from other parts of the city. Many of the new business owners also bought homes in Historic Kenwood. The Historic Kenwood Neighborhood Association was soon facilitating a crime watch, monthly porch parties and numerous community-building events. In 2002, the Grand Central District received a Florida Main Street Designation; in the years since, bike racks, planters and distinctive signage have sprung up among the many independent businesses. And in 2003, Historic Kenwood became one of the handful of St. Petersburg neighborhoods to be listed on the National Register of Historic Places. In Historic Kenwood the quintessential bungalow feature—the welcoming front porch—serves an important community function, too. Because Historic Kenwood was a transitional urban neighborhood, close to freeway exit ramps and vulnerable to unwanted incursions, there was a constant push among residents to stay outside, work in gardens, take walks and be both visible and vigilant, and it continues today. To further it, some 200 homeowners have chosen to restore their closed-in porches back to their original open state. Porch parties are commonplace, and the local park welcomed a pavilion constructed to look like a Craftsman porch. With devotion and hard work, seeds planted more than a decade ago have flourished.